among the aisles: Alley Oop! So my first proper trip to Wellington in years ended up being far more profitable than I imagined. I assumed it would be full of over sized coffees and funk rock, but instead it was amazing Tex Mex food and the best record shop in New Zealand. I expected Slow Boat to be a bit better than Auckland's Real Groovy, but really it put us to shame. I ended up leaving with as good a haul as I could afford and sadly had to leave a fair bit behind. Best find? 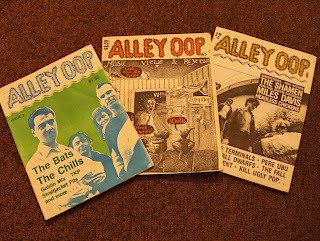 Three issues of Alley Oop; pretty much the best fanzine I've ever read. I can't really find any information on Alley Oop, I'd only seen an issue once before when a workmate from the library brought one in he'd borrowed off someone else. But that brief look was enough to let me know this was something I needed to track down. Published around 1988 and seemingly lead by Bruce Russell (guitarist in Dead C and founder of Xpressway). It's a near perfect document of an exciting and important period in music history (to me anyway). It's fascinating to read contemporary and often critical accounts of "classic records", partically Russell's muted review of The Bats' Daddy's Highway. Although it's not all Flying Nun and what was to become Xpressway bands. There's a great review of Miles Davis' NZ tour and record reviews of any internation albums considered worthwhile. Almost all the writing could be held up as perfect examples of how to capture the excitement of music, but also combined with a critical confidence which reflects immense knowledge and wisdom. 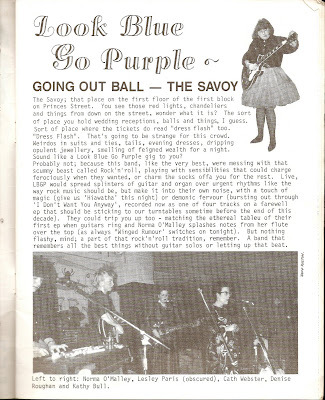 I'm considering scanning the whole thing and posting it up somewhere, but for now we can make do with a review of the last ever Look Blue Go Purple show. Memorize it and pretend you were there!! What a find! I had enough joy going through old Rip It Ups in the library, let alone finding a swag of zines... Mmmm. The publisher and initial editor of AO was Jeff Ruston, after the first couple we got Paul McKessar in to edit it as he had a journo background. I was only ever a writer, though I did write for every issue. Actually, I should say that Garage was even better than AO. Have you ever seen it? Richard Langston the TV reporter was the editor 1984-86, so it pre-dated AO. Richard was the ideal editor, he really had a passion. We published great stories on the Clean, Double Happys (they got a cover), Scorched Earth. They have them at the Hocken Library, and possibly the National Library as well, I think. Yeah I saw an issue of garage at slow boat too, but it was a bit out of my range. I think it had The Puddle on the cover, or maybe just their name and a Sneaky Feelings picture. Only they were all sealed so I couldn't have a read. Maybe checking National Library canbe something for my next Wellington visit. Oh and sorry for the editor stuff up, your name just seemed to pop up the most. Maybe I should get Richard Langston to have them scanned and made available. By 'out of my range' do you mean they wanted too much money? I've never seen any for sale. No problem about your misconception, I was involved in making it happen, I just didn't drive it. I was preoccupied with the whole label crusade. Yeah i think it was $20, which isn't too much I suppose - I was just out of money. It would be great if they could be made available to read in some way. 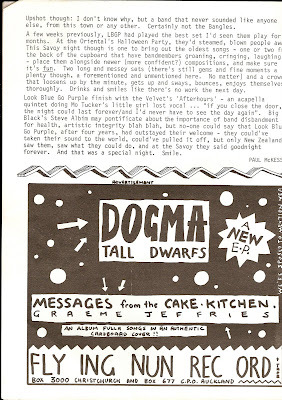 I remember reading the Flying Nun special Real Groove did a couple of years ago and thought it would be a shame if the writing in Rip It Up, and later Real Groove, end up being the only NZ music writing that gets remembered. Chris - and Bruce if you are about - my mate Jimmy B told me about your correspondence re alley oop and garage. chris, we put six issues out of garage and I still have a few copies of issue six. Send me your address - I'll send you one. I've always wanted to put out another issue. It'd be great - all the music we've loved since issue 6 ...about twenty odd years worth of listening. Thanks for getting in touch. An issue of Garage would be great. If you click on my name it should you should be able to send an email, rather than me just posting my address on here. I was actually just reading a masters thesis the other day about alternative music in NZ, it had plenty of favourable things to say about Garage.